Check our Events Calendar for the most current schedule. Active, safe fun at affordable prices! Events are priced per event per child & accompanying adults are almost always free with participating child--a built-in "two-fer" because we believe families who PLAY together, STAY together. 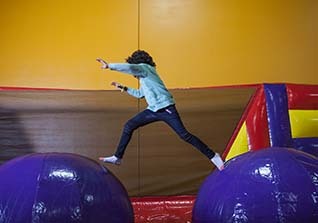 Unlike other indoor play centers, enjoy our inflatable rides and games WITH your child! Due to high demand, reservations for a group of 5 or more require payment in advance with a credit card. We'll bill your card for all no-shows at full admission price. All paid online reservations are non-refundable 24 hours or less before event start time. Carried infants FREE. Check out our Preschool Playtime schedule, too! two convenient locations during the weekend! 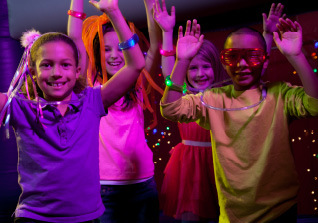 Turn out the lights and turn up the special effects fun with Cosmic Bounce! Active, safe fun at affordable prices! Events are priced per event per child & accompanying adults are almost always free with participating child--a built-in "two-fer" because we believe families who PLAY together, STAY together. 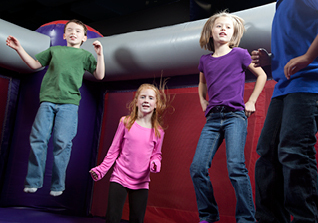 Unlike other indoor play centers, enjoy our inflatable rides and games WITH your child! Scheduled at various evenings throughout the year. Facebook & Instagram for notice of these popular events! The endless excitement of our inflatables and games is perfect for the whole family, and there's no better place to bond than BounceU. Our value-priced Family Nights are scheduled throughout the year, so be sure you're subscribed to our email list and following us on Facebook! RESERVATIONS ARE REQUIRED AND SPACE IS STRICTLY LIMITED. Price varies for two hours of family fun, food and drinks! See our Calendar for more details. Paid reservations are non-refundable 24 hours or less prior to start time of event. crafts and more at our open play events. Active fun, games and great music for kids 6 and under. Events are priced per event per child & accompanying adults are almost always free with participating child--a built-in "two-fer" because we believe families who PLAY together, STAY together. 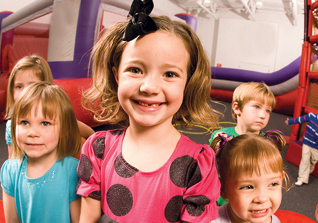 Unlike other indoor play centers, enjoy our inflatable rides and games WITH your child!